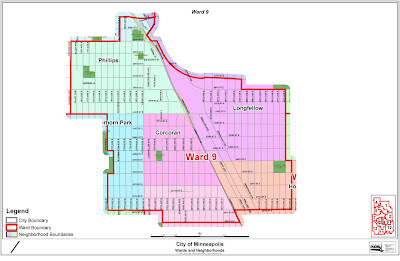 As proud Longfellons (inhabitants of Longfellow), Gerg and I rokked out with our caucus out on Tuesday night at the MINNEAPOLIS W-9, P-01 PRECINCT DFL caucus. Apparently, a bunch of other people had the same idea. 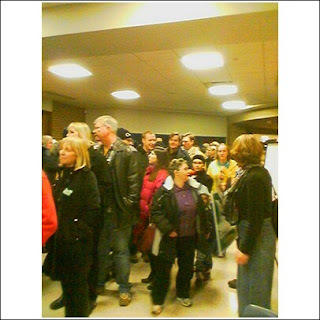 Our precinct caucus was raucous . Folks filled the slushy parking lots and streets on Tuesday night at the Anne Sullivan School. At our caucus, we saw one person campaigning for Clinton, and dozens for Obama. Highlight: there were two 18-year-old cheerleader types out front waving signs and yelling. "You'd better vote for Obama! For real!!!" To some lady: "Hey, are you voting for Obama??? AWESOME!!!" The types inside were less cheerleadery and more "all business" as they tried to figure out where to go to cast their vote; they ducked and twisted to avoid the sticker and pamphlet legions as they formed lines throughout Anne Sullivan School. Overall, people were smiling and friendly... seemed real happy to be casting their votes for a DFL candidate. According to Channel 4000, Obama's support doubled that of Clinton throughout MN. After caucusing, I felt ALIVE, so I checked out Iced Ink at the 400 Bar. and here i thought i was the only dork saying "rock out with my caucus out" all day . . . guess Longfellonitians think alike! Peter - that's because we rule! !